The Cat's Eye Nebula is a planetary nebula - the gaseous ejection of a dying star as it transitions into its white dwarf phase. The star has ejected rings of gas in several phases. The oldest ejecta from 60,000 years ago forms the very faint outer halo, while the very bright inner portions are from ejections around 1,000 years ago. NGC 6543 was the first planetary nebula for which William Herschel studied its spectrum. He found some unexpected spectral lines which eventually proved to be the green lines from oxygen emission. Today we know that these oxygen lines are common in many planetary nebulae, and account for the typical green color we see in these objects. Photographically, the Cat's Eye Nebula is quite challenging. The bright inner portion has a very high surface brightness, requiring short exposures to capture it well. Conversely, the outer halo of the nebula is very faint, demanding long exposures. To create this image, I used an HDR (high dynamic range) method to combine the short exposures of the core with the long exposures of the outer halo. This image is also populated with an excellent collection of background galaxies. Most prominent among these is the fairly bright spiral galaxy to the left of the nebula, NGC 6552. In this image, North is Up. This image is a 55% crop of the 1960mm focal length image. Software Used Images Plus 5.0 for camera control, Images Plus 5.5 for calibration, stacking, digital development, adaptive Richardson-Lucy deconvolution, multiresolution sharpening, smoothing and noise reduction. Photoshop CS5 used for levels and curves, color correction, selective color, vibrance, match color, high pass filter, star shrinking, lab color, saturation adjustments, and screen mask invert. Gradient Xterminator for gradient removal. Straton for star removal. Carboni Tools for additional saturation adjustments, noise reduction, and smoothing. HLVG for additional color correction. Focus Magic for focus restoration. Notes This image is my first light image with a C11 HD Edge. While I was very impressed with the sharp optics and versatility of this telescope, I decided that it won't work well for the way I like to image. The telescope has a very specific distance (146mm +/- 3mm) that the camera's focal plane needs to be from the back of the telescope. With the combination of the ONAG On-axis guider I use and the thinnest possible electronic focuser I could find, the camera ends up being a little over 10mm outside of this specification. The images at f/10 still looked pretty good. 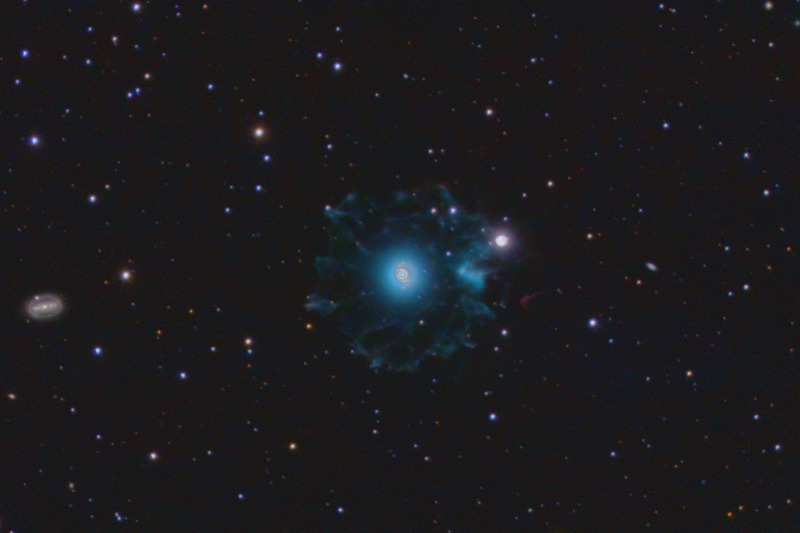 However, I could not achieve focus when using the f/7 focal reducer (an absolute necessity for many deep sky objects). Retaining the entire dynamic range of this target was quite a challenge. While photographing this image over 5 full nights, we were "enjoying" some of the hottest nights we'll have all year. Most of the nights were around 70F. This high heat causes higher than usual noise from the camera's sensor. Despite having 25 hours of imaging (which usually brings noise down to a minimum), the image has more chromatic noise than I would prefer. Nonetheless, I am quite happy with this image. This image won 1st place in Astrophotogallery.org's July 2013 Nebula category. This image was published by Astronomy Magazine as its Picture of the Day for September 3, 2013 (and then they chose it again on November 7, 2013! ).